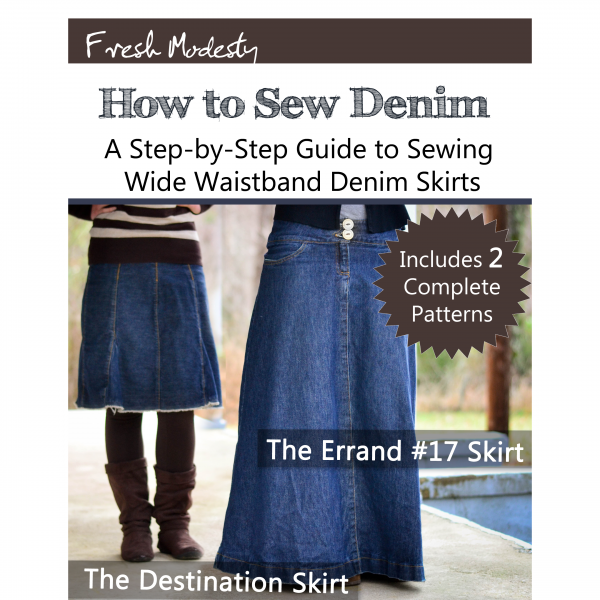 Fresh Modesty: How To Sew Denim is a 63-page eBook chock full of step-by-step color pictures and instructions for creating both The Destination Skirt and The Errand #17 Skirt. 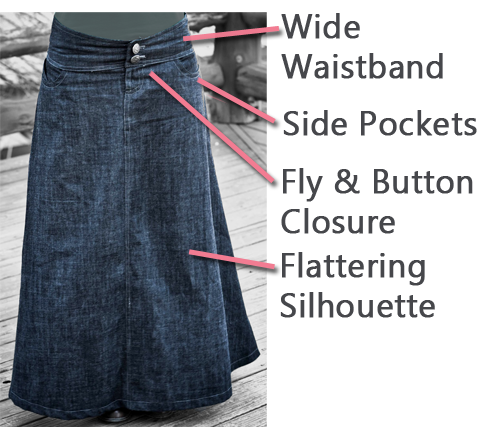 The eBook features instructions for creating these two styles of modest denim skirts that both feature a flattering and functional wide waistband with front fly detail and optional side and back pockets. According to the Global Denim Project, “On any given day nearly half the world’s population is wearing blue jeans.” That’s a lot of denim! Yet, why is it hard to find a modest, stylish, flattering skirt that resembles jeans for those of us who like skirts? And forget cheap. There’s an answer, if you’re willing to exchange some elbow grease for affordability! 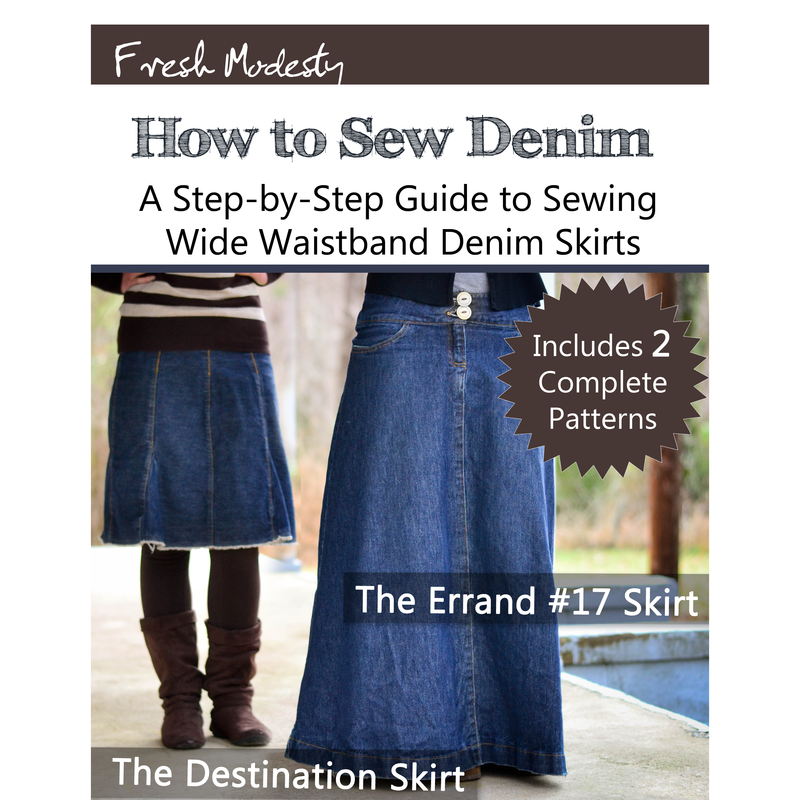 This eBook guides you each step of the way, making it easy to craft a custom denim skirt for you or a friend. Is denim hard to work with? Not at all! It is thicker than most fabrics, but it has little stretch, is very forgiving, and oh so durable. These skirts last forever and only get better with wear. Denim has the unique quality of becoming more attractive the more worn it gets. For these skirts, that means the waistband conforms to flatter and fit you exactly, the seams are accentuated by fading in the relaxed, fabulous style of “authenticity” as it is called in the fashion world, and the skirt’s hang remains modest and complimentary. This eBook includes premade patterns (one size) for both skirts with instructions and plenty of pictures for how to customize and draft for your own measurements. Because it gives you the ability to draft your own pattern specific to you, this is for all sizes of women. It might work for a young girl as well, but the style of the waistband works best on girls with hips. Denim is an awesome fabric. In the eBook, I discuss what kinds/weights of denim to buy and where online to buy it if you can’t find it in stores, so you can be informed. Although it’s durability makes it worth it, denim isn’t the cheapest material ever, so I include diagrams of how to make the most of your fabric. If you have any doubt of denim’s super practical style, you can go here to see some of the outfits I wear my skirts with. Disclaimer so you know what you’re getting into: It’s not perfect. This is not a pattern with neat little lines for sizes and notches to match up. This is an extremely detailed tutorial that, if read carefully and thought through, should produce a completely custom skirt that lasts you years. That said, I am on-call mostly 24/7 to help you with any problems you may encounter- just email me!